Editor’s Note: This article was originally published in Vol 28 Issue 4 of the print New Day Herald, March 2015. The article is used in the new Joyful Transitions PTS class brought forward by Carol Jones. Many of us were witness to the beautiful, powerful process of our friend Ken Jones’ passing from this world in 2010, and the way he and his wife Carol engendered support from the MSIA community at the time. 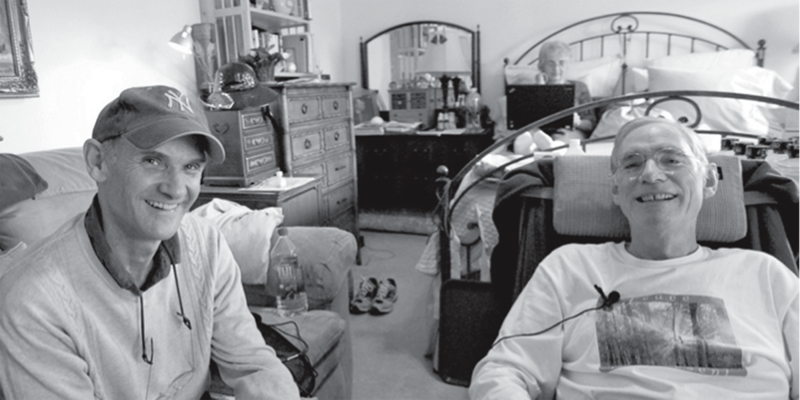 Kevin McMillan interviewed Kenny for the NDH when he was in the process of his illness. My friend Ken Jones and I spoke in he and wife Carol’s cozy bedroom at Prana. We chatted while Carol did email in the background and David Sand snapped some photos. K.M. So Ken, I’ve known you a long time. Helen Bradley and I picked you up at the airport when you first moved to Prana 15 years ago. K.M. At which time, I don’t know if you remember, but we predicted that you might be a good match for Carol. K.J. [Laughs] I heard about that! Yeah, I flew in from Kauai where I’d been living for 6 years, when I found out about the (PTS) Masters Program, and I said wow, that’s for me! So I called up and applied, got accepted for the Masters, and then I found out that if you’re a Prana resident you can take the Masters for free. This was a time when the construction was going on after the Northridge earthquake, and there was a lot of noise and dust, and clamor, and people—you know living at Prana wasn’t very popular then—so it was pretty easy to get accepted as a resident. Then I had to get rid of a whole lot of stuff so I could move, and came with a great big shipping crate full of my old stuff, and put it down there on the basketball court, and moved in. Moved in right across the hall from Carol, and no, I didn’t know that you were doing matchmaking, but I was doing my own matchmaking, and so was she. Because I was casting a hook out there, say- ing man, I’ve had a bunch of relationships that haven’t worked out, I want a Soul Initiate, it’s time… everything else I’ll take, but I want a Soul Initiate. So, that’s what I put out, and we discovered each other. K.M. And then how long later did you guys marry? K.J. A little over a year. As part of my (Prana) church service I had to volunteer, and so I chose three different paths to check out and see what I wanted to do. And one of them was assisting Carol with her PTS work. I’d go down to her office a couple of nights a week for a couple of hours, and started creating some custom databases. I would assist her doing her work, and so we got to have a lot of conversations and got to know each other, and heck—it was just the following month, wasn’t it Carol, at Thanksgiving—that after the Thanksgiving meal which we both helped prepare, we went into the large seminar room with everyone else to watch a movie, it was something like Little Buddha, and we sat next to each other and held hands. And that was the first time we expressed any affection for each other. That’s when we started dating, and that was I guess our first date. But anyway, that was how that relationship got started. K.M. : And then I remember I sang at your wedding at Prana. K.M. And you and I come from towns in South Carolina about 30 miles away from each other, but we never knew each other until Prana. K.M. And now we’re continuing the journey. So I’ve known you a long time, and right now I’d say that you seem more radiant and clear, and loving and balanced, than I’ve probably ever seen you. K.J. I’d say that’s true as well. This has been a time for consciousness as well as physical clearing, and cleansing and purging and forgetting and forgiving, and letting go and loving unconditionally. All that’s been going on. So it is indeed a fantastic—not just a blessing—but the answer to a lifelong prayer, to clean out and get with what’s real, and be the spiritual being that I am, the divine soul that I am. I’ve said those words before, but now it’s coming from a place of realness and conviction. I know that’s it because the rest of the crap’s pretty much gone. [Laughs]. Every day is just so beautiful, and I’m so grateful. K.M. So what would you like people to know about what you’re going through right now? K.J. My change of life started back in June (2009) when I had a stomach pain and went to the emergency room on my doctor’s advice, and found out the melanoma that I had to have surgery for back in 2000 had come back and metastasized through quite a few of my internal organs. It was a shock and a surprise. Melanoma’s a very aggressive type of cancer, and very deadly usually, so the doctors wanted to do some further scans and tests, and found out that that’s indeed what it was, and suggested that I’d better get chemotherapy starting tomorrow. Well, somehow I had already found out that chemotherapy doesn’t work with metastasized melanoma. All it does is over-tox the liver and kill you. I mean, it does reduce the tumors temporarily, but it gives you maybe one or two months’ more life, that you supposedly wouldn’t have had if you hadn’t done the chemo. They said surgery and radiation were out of the question, so the only option was chemo. But that’s partly because those are the only three legal options that doctors can offer in California anyway, so I didn’t have any other choice, and they don’t know anything else. I had a friend who advised me to look into Gerson Therapy, which is based on hyper-nutrition and de-toxification through organic vegetable juices. You bring the body hyper-nutrition, and drive the toxins out of the cells and into the bloodstream, and then use coffee enemas to allow the toxins that collect in the liver to flush out on a daily basis. Keeps the liver healthy. I just did a blood test yesterday. My liver and kidney functions are almost normal, and I’m here into… this is the seventh month I guess, and I don’t have any neurological symptoms, although I do have brain tumors. The melanoma’s gone into my brain, and heart, and lungs, and digestive system, and who knows where else it could be? And I’m suspecting that it’s in my prostate; I know it’s in the gall bladder too, ribs, pelvis, and one other… can’t remember the other organ—but there’s another one affected right now as well. So it’s kind of a race for time. K.M. I’ve been seeing you pretty regularly the last few weeks, and just from the outside, I don’t see you in a lot of discomfort. Of course, I’m sure there could be times that I’m just not seeing it, but is there much pain? K.J. No pain. My oncologists are quite puzzled, not only by why I’m still alive, but why I’m not in pain, why I’m not suffering, why I can still stand up and walk around, have a good time talking to people, and be pretty much functional. How is this possible? Well in my opinion it’s the Ger- son Therapy that’s keeping me alive right now, but it looks like, in spite of the Gerson—which has benefited me tremendously—the melanoma is still the overriding thing going on, and it’ll eventually take me down if I don’t do anything differently; through seizures, or a heart attack, or something like that. So, you know, facing that very real prospect, I’ve had tremendous counseling, and blessing and comforting from John Morton—and J-R— but John Morton has personally addressed my situation several times, and reminded me that what’s the big deal, we’re all taken care of by the Traveler anyway, and everybody’s going to let go of their body at some time or another, in some way or another. It’s temporary baby, for everybody! So you just let it go and you go into God’s arms with the guidance and protection of the Traveler, and you float into the Soul Realm, and hey—there you are baby, in a better place. So there’s nothing to fear. For me, death has no more fear than going to sleep. You just let it go, and you go into something that’s, well… here is very limiting, and constricted, and challenging, and requires constant vigilance and resourcefulness. And you move from that, into a place where there’s this huge expansion of peace and joy and love, and wow, who wouldn’t want to do that? So there’s no fear here at all, and I’m just enjoying every day to the maximum, and so grateful for all the love and the support, and good cheer, and the blessings, and the Light and love that people are sending me in all kinds of ways. And I’m just soaking it in. It’s really fantastic, and of course, it’s a fantastic blessing to be living here at Prana, Peace Awareness Labyrinth and Gardens, where the energy is the best on the planet in terms of quality and purity of Light and upliftment and, wow! K.M. So, what would you say to others who might be diagnosed with a similar condition? K.J. Seek all the alternatives and take full responsibility for your own therapy, your own course of therapy, your own well-being, your own state of health. Listen to the doctors, listen to the alternative practitioners, gather information, but make your own decisions. Don’t let any of them take authority over your health. That’s what I did, and I’m so glad and so blessed. I have orthodox doctors, and I have alternative doctors, and practitioners, and friends who are always suggesting things that might help, but I’m making the decisions about how I do this. And it’s a strength-building thing to do that. There are plenty of doctors that are curing cancer out there without chemo and radiation and surgery. I will be attending the Burzynski clinic starting soon for two weeks [February 8] in Houston, Texas, where they’re doing advanced genetic research to clear cancer from the body, all kinds of cancer. They conduct FDA-approved clinical trials for this, so it’s all kosher as long as they stay within certain guidelines and do certain protocols. But the main thing is that this Dr. Stanislaw Burzynski has come up with a way to alter the genetic make-up of the body, to replace genetic parts that are missing in cancer patients, and to remove parts of the genetic make-up that are causing the cancer. He calls it Antineoplaston Therapy, which is just a big word he made up that means anti-cancer. It has to do with modifying peptides and proteins into certain forms, first with injectable medicines to identify your proper course of therapy, then once they get that course set, they give you oral pills to take home, and check in with you once a month for three months, and make sure things are working and you’re on course. It’s very expensive, but fortunately, we’re able to do it at this time. We’re very excited about it, and we’ll be flying out Monday morning with as much of our clinical gear as we can hide in our bags. [smiles] My bedroom’s sort of turned into a mini clinic here. But we have the fantastic blessing of the assistance of Heartreach, which is assisting us in setting up volunteers in Houston, in the church, who will be doing this very valuable task for us—shopping, cooking and juicing for us while we’re there. A friend in the Dallas-Fort Worth area is putting that all together, and coordinating it for us. It’s such a fantastic service that she’s doing for us, because it’s a lot of work, and it would be overwhelming for Carol to try to handle that and all of my immediate needs as well. K.M. Speaking of Carol, I know that she’s been an amazing source of love and support for you. What’s it like to have that kind of love and support? K.J. Wow. Beyond anything I had thought could be. I’d heard about unconditional loving, heard J-R talk about it many times, and thought about it, and attempted it. And what I see every day is Carol demonstrating it. And I mean to the point where she wants to take care of me and make me well so much that—I don’t know—sometimes it’s hard to take it all in, but I’m work- ing on that. The Loving Each Day (daily email quotes from John-Roger or John Morton) today talked about loving each other 100% in a relationship, and I see her doing that, day after day after day, loving me 100%. And I told her today, well I hope I am doing the same for her, and if I’m not, I’m certainly going to be looking for ways to bump my percent up to 100 for her as well. So, it’s the sweetest, most caring, most caressing, supportive… she gives me the feeling that she would do anything to take care of me. She goes shopping, she prepares food, she tucks me into bed at night, and washes me, she gives me showers in the morning. I mean it is phenomenal what Carol has been expressing, and coordinating paid workers as well as volunteers to help us do everything possible to keep me healthy in the physical body so we can spend more time together. It’s amazing. K.M. It’s a beautiful ministry. K.M. And in my perception you guys’ relationship is just so sweet these days. K.M. Speaking of taking care of your body, I know you’ve lost a lot of weight. I wanted to ask, has the relationship to your body and the way that you see yourself and your body changed? K.J. Well somewhat, you know, I can’t help when I look in the mirror to see I’ve lost 60 pounds. The melanoma is eating up my skeletal muscle, so each day it becomes a little more challenging to stand up and walk, because I get weaker. So that’s why it’s kind of a race against time to get to the Burzynski Clinic and get this therapy going, so we can reverse that and I can start, you know, exercising and building muscle back. It ’s not like I can’t do it. When I was fourteen I had an operation on both my knees. They put me in a wheelchair for a month, and my muscles atrophied at that time, and I lost all the muscle tone. At the end of that period when I first stood up out of the wheelchair and tried to walk, I could only walk across the room and sit down. So it was starting almost from scratch, learning how to walk, and not just the muscles, but how to coordinate it. And it was a proud day when I stood up and walked across the room. And this would be very much the same, once the cancer’s in remission, which in Burzynski happens pretty quickly. I can start building my muscle back and get my strength back, so I’m looking forward to that. But it does affect my body image, is that what you’re asking? K.M. Well, this may be just a projection, but I was thinking about this to ask you today. I know that for me, when I was in the hospital a while back, and I wasn’t feeling well, and I was looking really pale and not well and had lost some weight, I just got the sense that I’m really not my body— that became really clear to me. K.M. That the body’s just a vehicle. K.J. Right, exactly. It’s like when I stand up to walk, I’m aware that I’m walking something other than what I am. I’m directing something almost like from above, you know, okay now we’re going to make the legs walk, you remember how to do that don’t you? You swing your arms, that’s right, let’s get it coordinated. K.J. Yeah like a marionette, yeah definitely [Laughs]. K.M. We always hear about living here and now. A lot of philosophies talk about that. You told me at one point that because of certain factors in your condition, the doctors have told you that there was a potential that something could rupture… that you could pass away at any time. [K.J. Right.] So what’s it like living moment to moment, day to day like that? K.J. You just take every moment as it comes. It’s almost like being in combat, where there are bullets flying at you, and you don’t know whether one’s going to hit you or not, and even if one hits you, you may not know it. You just go on, you know? I watch these things on TV that show people being shot at, and I think, that guy acts like it’s not bothering him. And I thought, well that’s what this is like, That I could have an instant medical event—a physical event that takes me out—and again, so what? Big deal. You just relax and let go, and there’s the Traveler, and you go. K.M. And really anybody could have that, it’s just there’s more of an awareness of it. K.J. Not just an awareness, but a probability of it with me, rather than somebody getting hit by a bus walking out the front of Prana or something. That’s low probability, but my probability is high that I’ll be taken out soon, quickly. So that’s there to contemplate, but I don’t spend any time thinking about that. Big deal. That’s a waste of time. K.M. It seems like you’re just being grateful for the day and for right now. I notice you’ve been doing a lot of, well…[laughs] some shopping online, and getting some things that you like, ordering some awesome clothes, and collecting authentic handmade replicas of American Indian items. K.J. You see that? I got that bark quiver. It’s an exact replica of one that’s in the Smithsonian, and handmade arrows, to go with the archery bow that I carved from a piece of wood, and my darts, and yeah… having fun! My Indiana Jones outfit, my Western outfit, and we just ordered custom-made cowboy hats. K.M. Oh, that’s so cool! Are you going to have them in Texas? K.J. Yeah, they’re going to send them to us on Valentine’s Day, and then we’ll wear them when we come back too. K.M. Is there anything you’d like people to know about the best way to deal with, or relate to, somebody with a situation like yours? K.J. Well in my case, most people are very open and loving and glad to see me, and it’s such a treat but, sometimes I see people looking at me like they don’t want to talk to me, or they want to avoid me because I look so different. In fact, most people don’t recognize me at first now. K.J. We bumped into some friends at the Co-op, and they didn’t recognize me the first instant, and then “Oh, it ’s you!” you know, that kind of thing. So, I don’t look at myself as some sort of invalid, and I don’t like it when people look at me that way. I don’t like that image, because I don’t feel crippled in any way. I feel whole. And just because my body’s going through some challenges, that’s not who I am. So it’s better to have people just treat me like a regular person and have a conversation with me. I had the great delight recently to have a friend who’s a doctor bring his family over and spend an hour with me, letting me talk about my process. He wanted his kids to see somebody who has a dangerous form of cancer, and how they’re dealing with it, perhaps quite differently from other people. And that was a treat, I loved to be of service that way. I decided that there’s not much I can do in terms of my ministry other than bring the Light and the love and the joy into people’s lives the best way I can. And one way is to share like that with people about my condition, my process. Obviously, my brain function isn’t suffering, my memory, my speech patterns, or any of those neurological things, so I can carry on a clear, consistent conversation with people. That’s partly because of the meds I’m on, and partly because of the Gerson Therapy. To allow me to focus on the joy that I have in my life right now, and to express that to people, is just such a treat, a blessing. My gift. [crying] My ministry. K.M. What a beautiful example of that. K.M. And I really see you being a spiritual warrior. K.M. Like J-R says, more S.E.s. [Both laugh] So Mr. Jones, just a couple of more questions. Number one is, you seem to be getting better looking, how can that be? K.M. Can I quote you on that? K.J. You may! It’s dazzling, I have to say! K.M. It’s good to be the king. So the last question. It’s been just great to talk to you here, and so what is it you’d like people to know about your life, and who you are? K.J. Oh, that’s an interesting question, sort of like an epitaph? Let’s see. Well, you know, I could say I’m a loving person, a divine soul, who’s enjoying every moment of life. I’ve learned not to take anything for granted, simplest things can bring great pleasure, and you may not want to put this in the article, but just being able to get up at night and pee, and get back in bed. There are people who can’t do that, and I am really grateful that I can, and so, you know simple things make a huge difference. Let’s see. I am the eternal optimist. I see myself going to this clinic in Texas and clearing my body, not just bringing it back to a state of health, but with an entirely raised vibration, almost like ready for the induction of a higher form of consciousness to come into this body that’s been so purified and cleansed, and you know, with no toxins or anything like that in it. So, I see myself coming out of this healthier than ever before. K.M. Well, I’m excited for you. K.M. Thank you for sharing, I really love you. K.J. I love you too, and I really appreciate all the loving things, and the fun that we’ve had, and the service that you’ve provided me in various ways, and it’s been a real treat, and a real intimate friend that I really cherish, and it’s been great. South Carolina buddies! K.M. Okay, God bless you. K.J. God bless you too. If you’d like to hear more about the PTS class, “Joyful Transitions,” please email Carol at carol@msia.org.